The new King of Prussia location for True Food Kitchen officially opens its doors on July 19. The new restaurant, located along Mall Boulevard next to Shake Shack, recently invited select guests to join them for a preview meal. 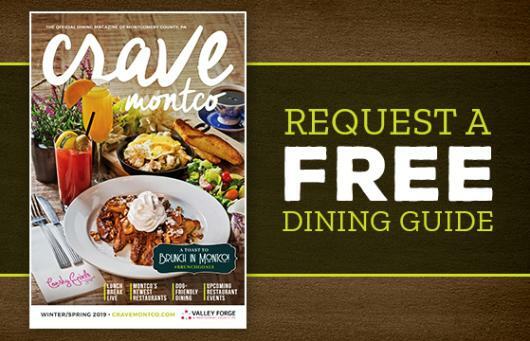 Crave Montco&apos;s Zach Brown and Caitlin Hoppel went for a first taste of this truly unique dining experience. Caitlin: Disclaimer: I’m fussy when it comes to matcha. I’ve been to Kyoto, I’ve experienced an authentic Japanese tea ceremony – and I really enjoyed this honey lemonade. 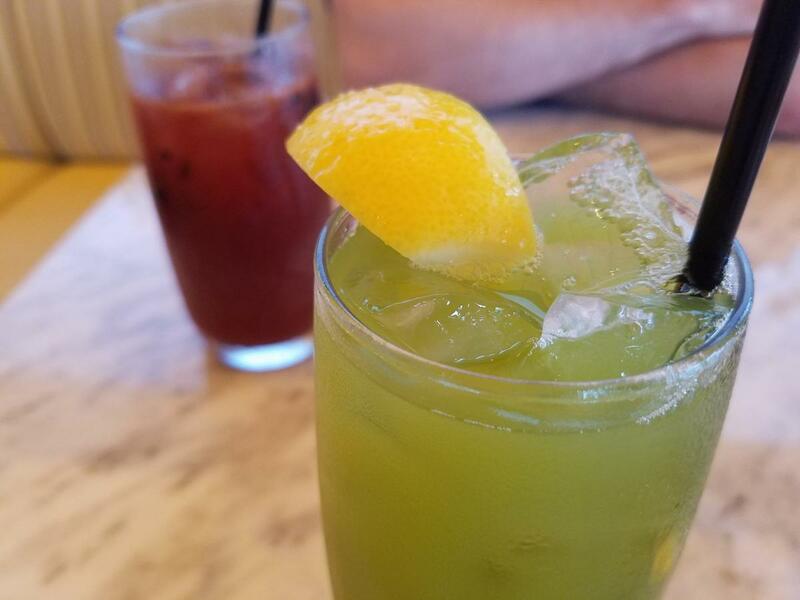 “Real” matcha should taste more earthy than sweet, and this matcha perfectly complemented the honey lemonade without overpowering it. True Food’s honey lemonade with matcha is a refreshing summer twist without a boatload of sugar. If you are looking for a sweeter lemonade, I would recommend the honey lemonade plain or with cucumber instead. Zach: I’m an iced tea junkie so the Medicine Man jumped out at me right away. It featured triple-brewed black tea, blueberry, pomegranate, honey and sea buckthorn and was sweeter than I had expected – powerful like a sweet tea, but with a different feel from the honey and natural sugars of the fruit. For those wondering, sea buckthorn is a berry (I had no idea either) and apparently a nutritious one at that. C: When I first read kale guacamole, my immediate thoughts went to kale artfully smashed in a mortar and pestle – more pesto than anything else. However, I can assure you this appetizer packed a guacamole punch. Z: Completely agree. Kale guacamole is a superfood mashup that really works. C: The avocados were ripened to perfection and blended with kale, cilantro, poblanos and pink grapefruit. The bright acidity of the grapefruit balanced the smoky heat of the poblanos and the creaminess of the avocado in what I would describe as a full-bodied guac. 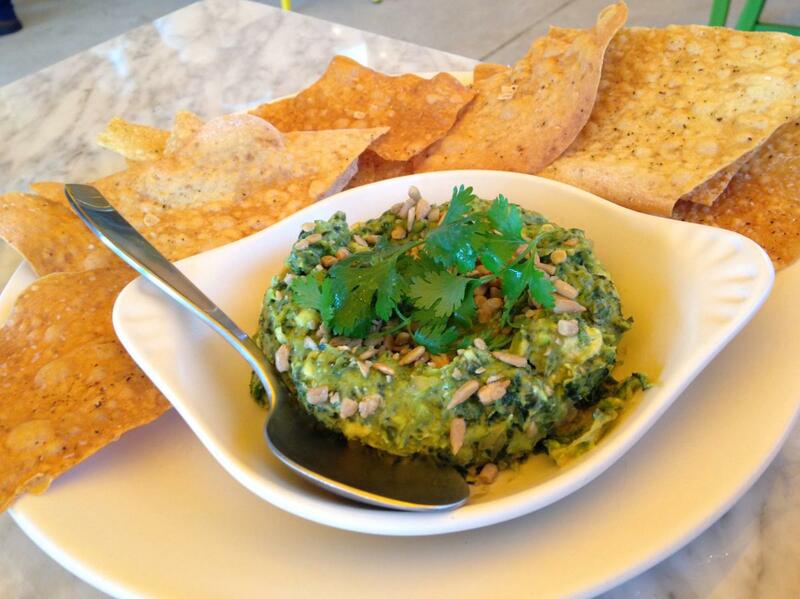 Top that off with nutty sunflower seeds, scoop it with a crispy pita chip and you’ve got one star of a starter. Z: The pita chips, for me, were the perfect complement. It needed that salty element to bring everything together. If I have one complaint, though, it’s that a few of the chips may have been a little oversalted. Otherwise, a great way to start the meal. C: I also appreciated that the pita chips didn’t crumble into pieces after taking a bite. It’s the little things. 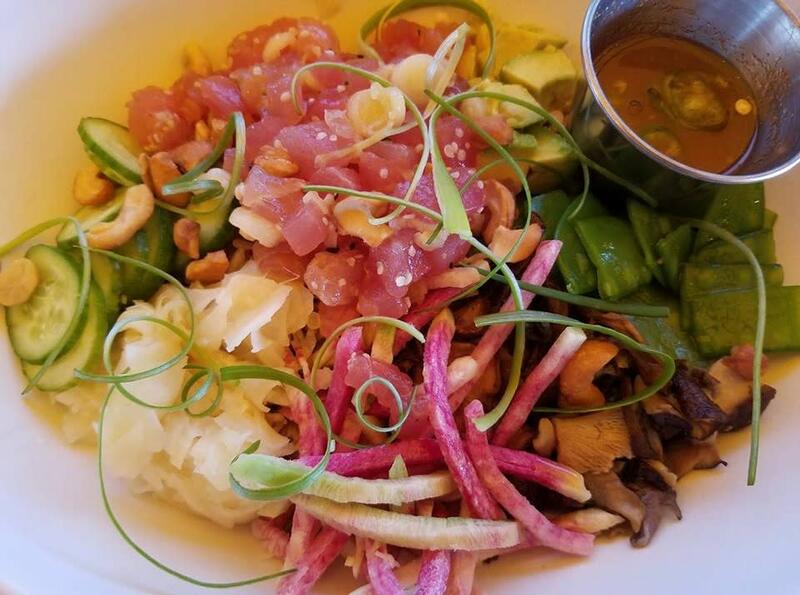 C: This poke bowl is a party of fresh veggies and fish. Wild caught albacore sits pretty among crunchy snow peas, earthy mushrooms, cucumbers, cashews, and millennials’ best friend – more avocado. And did I mention all of this rests on a bed of quinoa rice? There’s a lot going on here – including the turmeric ponzu sauce that comes on the side – and it’s all delicious. C: Whether you eat the ingredients individually, in combos, or shovel it all in your mouth at once, you’ve got a perfect bite. My one, albeit nitpicky, comment is that the quinoa rice was difficult to eat with chopsticks. Since it’s not as starchy as short grain sticky rice, the quinoa rice is a little cumbersome to handle. 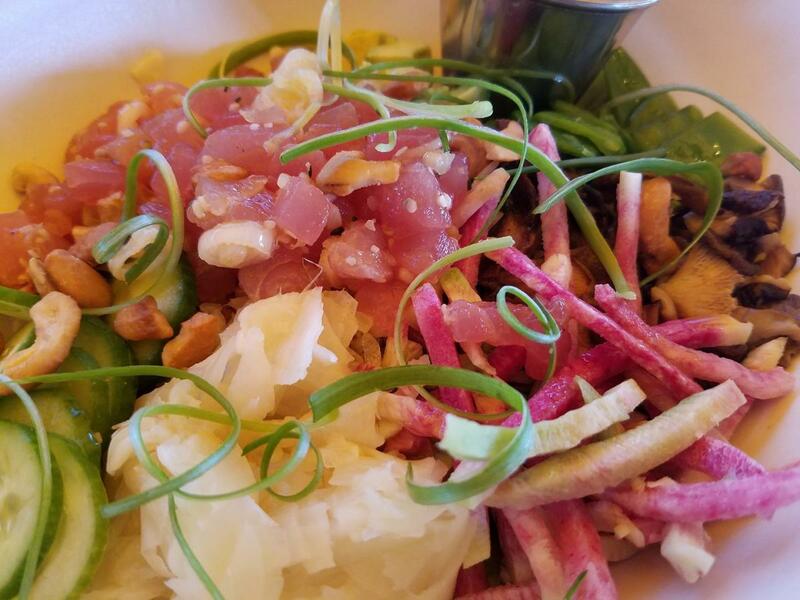 Utensil of choice aside, the poke bowl is an excellent entrée. Z: Of the four bowl options on the menu, the ancient grains bowl had the ingredients that called out to me most: miso glazed sweet potato, turmeric, charred onion, snow pea, grilled Portobello, avocado and hemp seed. Everything worked well together, but the star of this dish was the sweet potato. Taking the first bite, I got the rush of flavor from the miso – salty and a little earthy. Then I got hit with an unexpected heat that got a little more intense with every bite. The dish is actually a vegan dish, but with the option to add tofu, chicken, shrimp, steak or steelhead. I chose the chicken to add protein without adding something that would overpower the flavors with it. The bowl was hearty and satisfying without the chicken, but I certainly wasn’t mad that it was there. 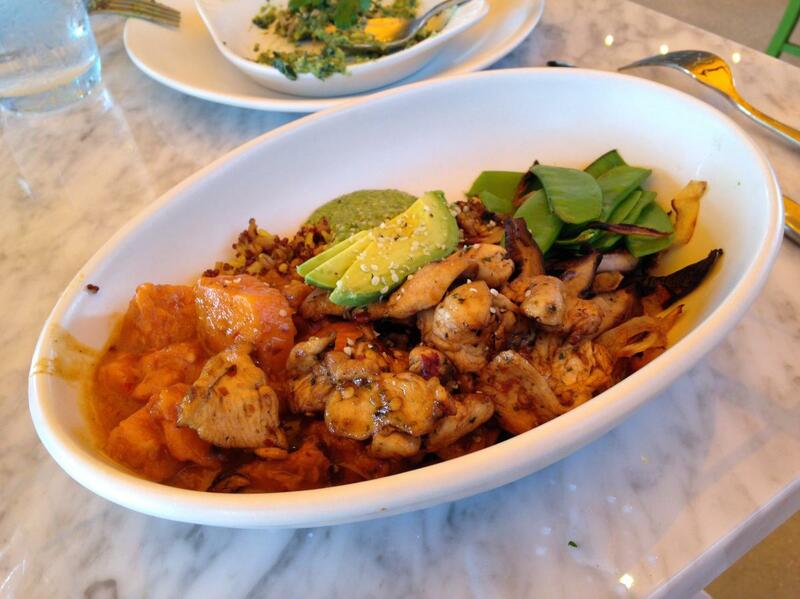 C: I love the concept of True Food Kitchen. The fresh, good-for-you and even-better-tasting menu is a match made in heaven for the KOP location. Z: It feels like there is a new restaurant opening in King of Prussia every day and somehow they all feel completely different from anything else. C: Their food guide even boasts a menu of anti-inflammatory ingredients, so you know the food is guilt-free. The restaurant space itself is open and welcoming, with spacious outdoor seating. 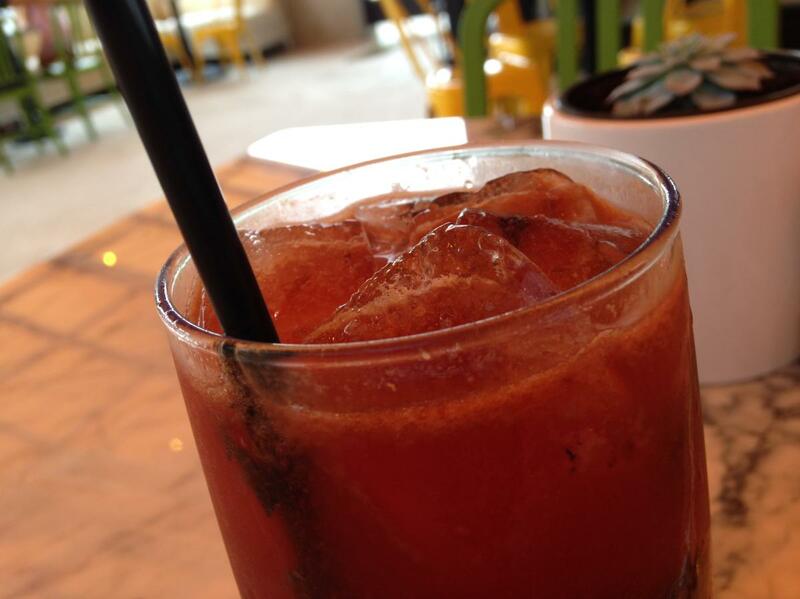 I would absolutely recommend True Food Kitchen, as I’ll certainly be back for more – their brunch menu looks delightful. Z: Agreed, though I have to say that the next time I go, it will be for dinner. The total bill for all of our food and drink was $60 which I find perfectly reasonable for dinner but a little too much for a lunch break for two. C: And next time has to include dessert. The flourless chocolate cake with vegan ice cream sounds incredible.